HAJI Wahab is an Umno grassroots leader. He was active for many years from way back in the 1980s. Today, he’s retired and enjoying life back in his hometown in Perak. He’s no longer leading the party at its branch. But he’s been a loyal party man and is still struggling to come to terms with the disaster of the May 9 general election. Haji Wahab admits to being confused at times. Under the watch of Datuk Seri Najib Razak, son of the country’s second prime minister, Barisan Nasional and Umno lost control of the Federal Government after six decades of uninterrupted rule. Haji Wahab believed in his party’s narratives but failed to read the writing on the wall. It took him almost three weeks to accept that Umno was indeed detached from the political realities on the ground. Today, Umno is licking its wounds. To be a credible opposition, it must now pick up the pieces and chart a new course. The process began yesterday with the election of office-bearers of the Youth, Wanita and Puteri wings. This will be followed next week with the election of the party president, right down to the Supreme Council members. Some people may have written off Umno, but this is naïve and short-sighted. For the likes of Haji Wahab and his contemporaries, Umno is in their blood. They wait keenly for the election of office-bearers, believing that the party must get back its rightful place as the country’s administrators. Of course, this is easier said than done. Haji Wahab realises that. Now he sees things more clearly. He’s less emotional, less defensive and more critical of Umno. Haji Wahab painfully admitted: “Umno has been rejected. Let’s be clear about this. I had refused to admit that Umno has many faults, that many of its leaders have been less than honest. “Many of us had taken things for granted. Kita ingat takda sapa boleh kalahkan kita (We thought we were invincible). Now, we need to rebuild and rebuild well. The leaders we now have are rejected by the masses. “Who among those who remain have the desire, idea, belief and commitment to rebuild the party? We need a few good men who can be the core of a new team and get us out of this rot. It is too painful for me. “I read about Datuk Seri Dr Ahmad Zahid Hamidi, Tengku Razaleigh Hamzah (Ku Li) and Khairy Jamaluddin (KJ) among those vying for the post of president. Can they really be counted on to lead the party, fix all the problems, gather the troops and mount a respectable charge at the next election? Umno members need to look deep and far into the future when choosing their new leader. Grassroots leaders like Haji Wahab can play a big role in determining who should be president. Those who are eligible to vote should do so of their own free will. For years, party warlords, especially ketua bahagian (divisional heads), determined who should be voted in. These ketua bahagian have their preferences and they often impose their choice on delegates. For years, they would “guide” some 2,000-odd delegates attending the annual party assembly on who should be president, the deputy and so on. But this practice should stop, especially after Umno had amended the party constitution governing the election of office-bearers. The election of top posts now lies on the shoulders of some 150,000 grassroots leaders from 191 divisions. The “democratising” of the election process is now more important than ever before. The grassroots leaders can actually turn the tables on the party warlords by choosing whoever they want. Party warlords have so much resources at their disposal to influence grassroots leaders — money is one of them. There are also other forms of patronage at play. At this point in time, the 150,000-odd delegates should put all these aside and choose leaders who they believe can really save the party. Over the years, politics has enabled individuals to look at Umno as a means for social mobility. They can climb up the social ladder and be looked upon with respect. This was good at first, until they started buying influence and votes. The rest is history. 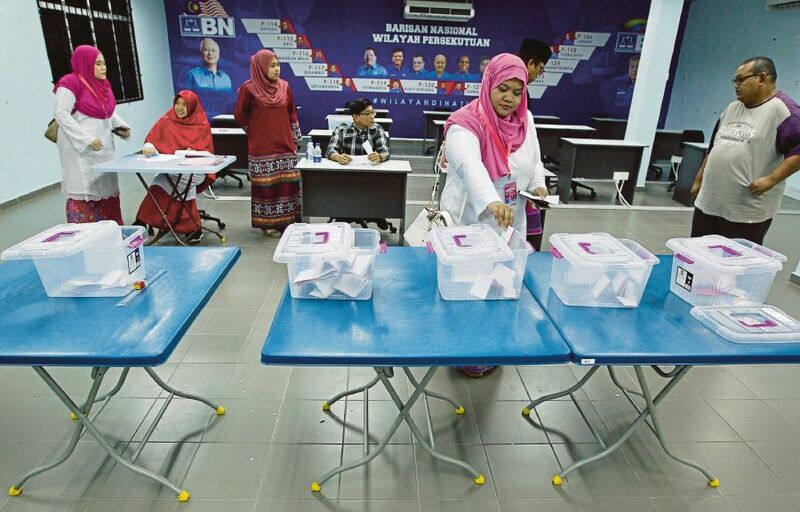 The May 9 general election should signal the end of the game for Umno warlords. The party must broaden its scope of democracy to the widest possible. Learn from past mistakes, of which there are many. Teach these warlords a lesson. Delegates must look beyond the party. They need to choose leaders who can appeal to the general masses (read general election). It won’t be an easy choice for delegates, but they have to pick a leader who can fit the party’s requirements at this point in time. In his grassroots view, Haji Wahab said it would take many years before Umno can get it right. Use the next five years to tighten party discipline, improve the narration, and most important of all — be truthful and honest to the rakyat. If Umno wants to be relevant, get rid of the corrupt and the pretenders, Haji Wahab said, with tears in his eyes.